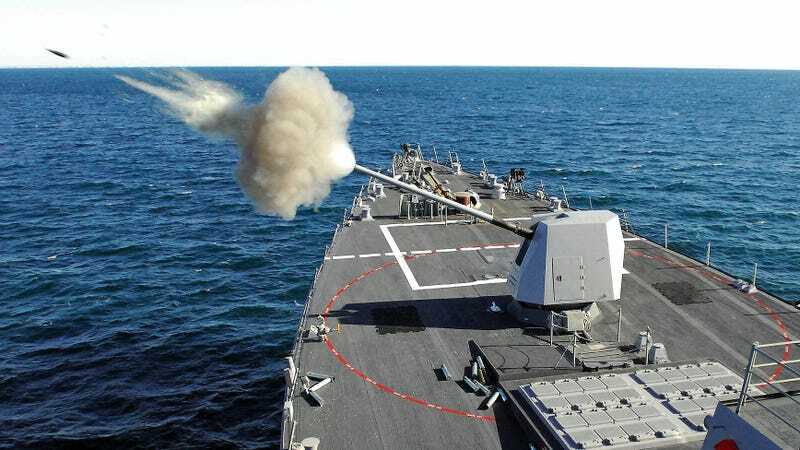 Raytheon's 155mm M982 Excalibur extended-range guided artillery shell is being shrunk down to fit into the Mark 45 five inch deck guns that are deployed aboard the Navy's Cruisers and Destroyers. This miniaturized sea-going Excalibur, known as the N5, could triple the range of current five inch shells and offer pinpoint 'danger close' fire support like never before. The Excalibur round really is a modern marvel. It can be hurtled out of a howitzer barrel under immense G loads, then once it reaches the top of its trajectory, it begins its guided glide path via pop-out canard control fins, which greatly enhances the shell's range over a standard 155mm round. Because it is guided, it can also hit nearly any target at near vertical angles, allowing it to strike the enemy in the shadow of steep mountains or in urban environments that traditional ballistic artillery could not engage safely. The outer edge of the current Excalibur's range is said to be about 25 miles and the USMC used pretty much every bit of that range in Afghanistan. Guiding itself to its target using a sensitive and greatly miniaturized inertial navigation system with embedded GPS, Excalibur is so accurate that it has been cleared to be employed against targets just 500 feet from friendly forces. Introduced onto the battlefield in Iraq in 2007, the rounds gave Howitzer units so much added flexibility due to the Excalibur's increased range, non-ballistic trajectory and almost perfect accuracy that the Army immediately upped the round's production from 18 units a month to 150. Since then, thousands more M982 shells have been built and nearly a thousand of them have been fired in combat. Today, the updated version of Excalibur costs about $50k a shell and the price has steadily decreased over time, even though the project has been a victim of the DoD's spastic spending practices. Considering that Excalibur gives standard artillery units a ring of 25 miles around them in which they can deliver an attack with the same precision as munition dropped or fired from combat aircraft, $50k a round is really not such a bad deal. Especially when you consider that using a fixed-wing aircraft to deliver a similar effect costs a minimum of about $20k an hour. It seems everything is relative in the world of precision guided munitions and their five digit or greater price tags. In a similar fashion to how the Excalibur gave Army and Marine artillery units a massive upgrade in range, accuracy and tactical flexibility, Raytheon is looking to do the same with the Navy's prolific five inch Mk45 deck gun. According to the manufacturer, with a smaller diameter non-spinning base and a smaller warhead, the Mk45's current range using standard shells, about 13 miles (the Mk45 mod 4, with its longer barrel offers a range of about 21 miles), can be tripled. This would give Excalibur N5 paired with the Mk45 deck gun a range of almost 40 miles, and possibly 60 miles when fired from the Mark 45 Mod 4 gun equipped ships. This means that a cruiser or destroyer could provide precision fires, even against targets located in dense urban areas, well over the horizon in support of shoreline operations, or deep into the enemy's territory if operating closer to shore in lower threat environments. Such a capability could be very useful when it comes to the concept of a classic Marine beach landing, but even more useful when used in support special operations missions. Basically, a Mk45 gun stocked with Excalibur N5 shells could replace close air support, which is often not an attractive option when SEALs or other special operations teams are operating clandestinely in hostile territory. This means, at the very least, a contingency force of attack aircraft don't have to be assembled and put into place if close air support might be needed. If the target area is defended by anti-aircraft systems, this could also mean throngs of support aircraft are needed as well. A guided artillery shell, traveling dozens of miles at mach speed, does not need to worry about air defenses or being shot down and captured by the enemy. This also means attack aircraft and support assets could be used elsewhere. When you look at it that way, the $50k per Excalibur round price tag is a total bargain. Time sensitive strike, the ability to hit a target within about an hours time is something the DoD is lusting for in the guise of many proposed high-end and expensive concepts, but for places like the Horn of Africa, a single destroyer could sit off the coast of major population centers and wait for commands to strike targets of opportunity with Excalibur N5 shells in mere minutes. In the past, such an attack initiated by a Cruiser or Destroyer would have to be prosecuted by a Tomahawk cruise missile, which carries a massive warhead or hundreds of sub-munitions that cover a wide area. Additionally, they take time to program and fly at sub-sonic speeds, which is not ideal for targets that need to be hit immediately. With an extended range guided five inch round, our cruisers and destroyers will finally have an 'intermediate' high-speed precision strike weapon, one that can also survive in areas where loitering Predator or Reaper drones carrying Hellfire missiles can't. During the Libyan conflict, America fired off well over 150 Tomahawk Cruise Missiles, each costing over a million dollars. Many of the Tomahawks' targets were based along Libya's shoreline, such as SAM sites and air defense radars. These could have been taken out by Navy ships 50 miles off shore at $50k a pop using the ship's main gun and long-range precision projectiles if they were available, not to mention being able to hit smaller targets in dense areas that the Tomahawk's 1,000 pound class warhead was simply too destructive for. Raytheon is already working on a laser guided version of the Excalibur which will be able to hit moving targets designated by troops on the ground or by unmanned or manned aircraft overhead. This opens up a whole new potential for naval fire support. The idea that a cruiser operating some fifty miles out to sea, having the ability to take out a single vehicle in a convoy or a small group of fighters walking down a street, with very little chance of unintended casualties, is game changing. Paired with unmanned aircraft, such as the Navy's MQ-8 Fire Scout, such a concept would allow for a ship to literally provide fire support for friendly forces while 'on the run,' not to mention taking out mobile high value targets in mere minutes after their initial detection. The Excalibur N5 could also be utilized to a more lethal degree in roles that the Mark 45 gun system already fulfills, such as anti-air and anti-surface warfare. Eventually, the rounds could even be fitted with a millimeter wave radar or infrared seekers allowing for large barrages to be launched at small boat swarms long before they get within visual distance of the ship itself. The reality is that the Navy has kicked around the five inch guided projectile idea for decades. Raytheon was supposed to supply basically the same thing as its Excalibur N5 to satisfy the Extended Range Guided Munition (ERGM) program that floundered for nearly a decade and a half, finally being cancelled in 2008. This was probably near-sighted in retrospect as the technology was just beginning to prove itself as a mature and reliable on the battlefield by the time ERGM was cut. Since the ERGM's cancellation, the Navy has been focused on developing its larger 155mm Advanced Gun System for the DDG-1000 Zumwalt class destroyers, which will feature its own precision guided, long-range round. This development process seems to have jump-started the idea once again that arming all of its cruisers and destroyers with something similar would make great sense. As a result and probably having to do with the Navy's gathering initiative to bring more offensive capabilities to every vessel it already has, last year the Navy sent out a formal request for information to vendors to see what solutions they had in mind when it came to turning their 5 inch guns into a precision guided munition launcher. Raytheon, the first to market with the Excalibur, already had the N5 in development, meanwhile BAe Systems, who makes Mark 45 gun, along with Lockheed, who has built the Advance Gun System's Long-Range Land Attach Projectile, have put forward their Multi-Service Standard Guided Projectile (MS-SGP). Testing has been positive on the MS-SGP, although it is not as mature or battle proven as the Excalibur. Italian weapons maker Oto Melara also put forward their guided 'Volcano' round as well. The US Navy is not the only customer both five inch long-range guided projectile teams have in mind. Hundreds of Mark 45 gun systems have been deployed with 25 navies around the globe, many of which have less of a 'blue water' mindset than the US Navy, with many of these Mark 45 equipped ships' missions being in littoral waters or in support of small amphibious forces. Fielding a simple 'plug and play' solution like the a guided long-range 5 inch projectile makes incredible sense and would give even the most lowly of Mark 45 gun equipped surface combatants a whole new strike capability to work with. It will be interesting to see if the Navy goes ahead and fields such a cost effective and scaleable solution to so many tactical problems it faces today. This is especially true considering that, at this time, only three DDG-1000 destroyers, with their 155mm precision shore bombardment capabilities, will be built. Giving current and future major surface combatants a similar capability will be essential, especially when it comes to supporting "low intensity" conflicts around the globe. Sadly, cost effective solutions like a derivative of a guided, long-range artillery shell based on a proven system like the Excalibur may be just too logical for the Navy brass to whole-heartedly embrace. Such a system's low acquisition cost, high flexibility and lethality may inhibit other high-ticket weapons programs that have overlapping strike capabilities. In the end, it may take other navies around the globe to stock their Mark 45 guns with this new asymmetric capability for the US Navy to finally bite the bullet (no pun intended... seriously!) and do the same. Until then, the Navy will be fielding the same capability when it comes to its main deck gun that it has for 45 years, which is becoming more irrelevant by the day.